Are you ready for a historic bar crawl in London? Some of the pubs in London were established long before the Great Fire swept through the English city in 1666. Pirates, gangsters, and literary greats alike have escaped to these illustrious alehouses in search of a stiff drink, many of which remain open to this day. Are you ready for a historic bar crawl in London? Discover three of the city’s oldest pubs! Built in 1546, Ye Olde Mitre is one of the oldest known pubs in London. The original building was expanded in 1773, and renovations continued during the early 1930’s. The decor pays homage to the history of England, complete with aging barrels, whiskey water jugs, and a crackling coal fire. It’s the perfect place to go when you want to enjoy a frothy pint and homemade bar snacks with friends. The Spaniards Inn, located between Hampstead and Highgate, has been mentioned in more than one famous novel. Lord Byron and John Keats were known to enjoy beverages at the London establishment, and it’s suggested that Keats completed Ode to a Nightingale in the Inn’s garden. Built in 1585, the Spaniard Inn is the perfect example of a quaint English pub. With low ceilings and antique dark mahogany, it comes as no surprise that Bram Stoker frequented the Inn for literary inspiration. Aside from the striking portraits and historic decor that peppers the interior of Ye Olde Cheshire Cheese, it’s the lack of natural lighting that gives the pub it’s distinct character. 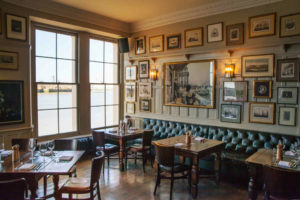 Originally built in 1538, the pub was renovated in 1667 and is now a popular destination for locals and tourists alike. Ye Olde Cheshire Cheese has been home to numerous interesting stories and former “regulars,” such as Polly, the Parrot! The resident bird lived well over 40, and her obituary was published in newspapers across the globe in 1926. AESU offers several trips to London and the UK, including Cosmopolitan, Euro Spree, Explorer, Euro Focus, and our most popular tour, Great Escape. This entry was posted on Wednesday, August 8th, 2018	at 10:24 am	. You can follow any responses to this entry through the RSS 2.0	feed. Both comments and pings are currently closed.